We believe big changes happen one person at a time, and so TCE Fund provides resources for the door-to-door canvassing work in partnership with our sister organization, Texas Campaign for the Environment. Canvassing enables us to reach diverse communities across many areas of the state. Our supporters share a common concern for the environment and a respect for the individual who comes to their doorstep with an important public health issue. You can contribute when our canvassers visit your community or call you on the phone – and you can give online at any time, of course. Do you have an old automobile you’re not using that’s just taking up space in your driveway or garage? Don’t send it to the junkyard – donate it to help us raise money. You’ll get a tax write-off. It doesn’t matter if it runs or what shape it’s in. (It doesn’t even have to be a car – we can take boats, motorcycles and RVs.) There’s free towing, so there’s no work for you. It’s as easy as filling out this online form and then watching us come and get it. Learn more here! 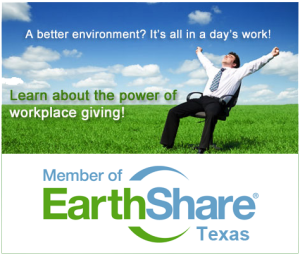 TCE Fund is a proud member of EarthShare of Texas, which is 501(c)3 non-profit foundation committed to making environmental support as easy as possible by giving working people the ability to donate through workplace payroll contribution campaigns. If your employer offers EarthShare as a workplace giving option, you can support our work and the work of dozens of other environmental organizations by giving directly from your paycheck. You can learn more about EarthShare of Texas here. Reliant Energy and EarthShare of Texas have launched a program that allows Reliant customers to help reduce their carbon footprints through the purchase of carbon offsets. And for each customer-purchased offset, Reliant will make a contribution to EarthShare of Texas and its participating organizations – and that includes TCE Fund. Learn more about this program here.